With the new season set to get underway, expectations for some area boys cross country teams have never been higher. Though many teams have to replace some top-tier talent, each is expecting to take steps in the right direction. New Britain, Southington and Plainville all have questions surrounding their teams heading into the season. All have a heavy reliance on their youth and could have a tough time competing with the better programs this year. After a solid season last year, the Redcoats will look to get even better this season after not losing a single key runner. Berlin has a good chance to compete for a Class MM championship and could be one of the better teams in the state this season. Newington and Innovation are looking to build off strong efforts last season. With both programs bringing back several of their best runners, the Indians and Ravens should be all over the top of the leaderboards this fall. Outlook: This season looks to be another building one for the Hurricanes. With the loss of Carlos Villarini, New Britain is left with a young squad with little experience. Chaz Williams should be a big addition to the team, coming off a big outdoor track season. Still, head coach Lisa Kawecki sees the early meets as a big step in the Hurricanes putting some miles behind them. “[I’m] looking forward to attend some new meets early in the season for our inexperienced runners to develop their strength,” Kawecki said. Outlook: Mixed feelings surround the Blue Knights entering the 2018 season. Southington enters the fall with a very young roster and a lot of uncertainty. Outlook: It should be another strong season for the Redcoats, who are fortunate to be losing none of their varsity runners. Seniors Joshua Ladd and Gianni Fanelli, along with junior Michael Parzych, will look to lead a Berlin team trying to take the next step. Head coach Steve Soucy expects the team to compete in the Class MM meet this season. Outlook: Many new faces come into the fold for the Blue Devils this season. With a ton of freshman on this year’s team, it could be a test for head coach Shaun Berard and his staff. “They are great kids and I’m looking forward to the season and seeing how well they all develop,” Berard said. Outlook: The Indians established themselves as a dominant program last season. 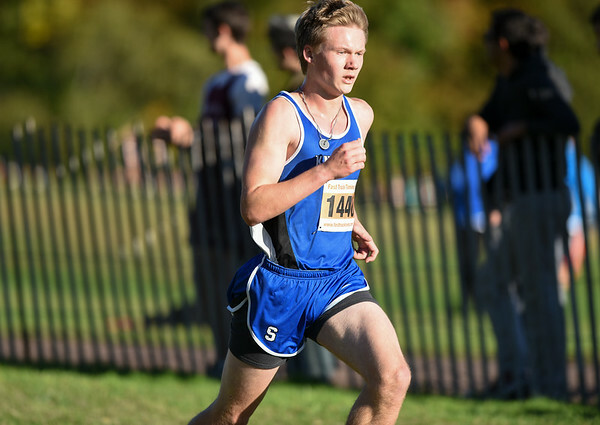 Newington is losing Brendan Henriques to graduation, but with many key runners returning, it will be set to have another great season. Outlook: Innovation will look to have another strong season in 2018. The Ravens won the CRAL conference title last season and hope to do the same again. Though it lost Jesus Santiago and Andre Sterling to graduation, Innovation still has a strong core of runners coming back. A.J. Corso and Brennan Kievman will look to lead as two of the team’s seniors. Gabe Matias will look to continue momentum from a strong freshman season. With the pieces they have coming back, the Ravens could be looking at a very successful season. Posted in New Britain Herald, Berlin, Innovation, New Britain, Newington, Plainville, Southington on Wednesday, 5 September 2018 20:44. Updated: Wednesday, 5 September 2018 21:24.